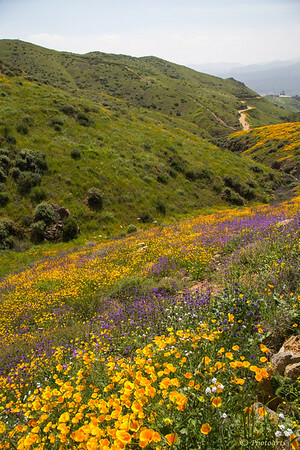 After years of draught, last Winter and Spring's rainfalls seem to have brought about a super bloom of wild flowers here in Walker Canyon, CA. Some say this was a 20 year bloom and the intensity of colors of these wild flowers show it! Oh, what a glorious springtime shot! Gorgeous sight. Makes me wonder how it compares with this year's (2018) blooms. I love the riot of color that can oftentimes spring up in the deserts. This is a wonderful capture. You really captured the gorgeous wildflowers of this spring. I love the CA poppies in the foreground, leading they back toward the trail in the background. Very nice.